Walk into your local supermarket looking for toothpaste and you will see a bewildering array of different toothpastes offering different benefits. But which toothpaste is right for you? And how will you decide? Because there are so many toothpaste options, we here at A Supa Smile have put together this handy ‘guide to toothpaste.’ We hope that it helps you sort through your toothpaste options and helps you achieve optimum dental health! There may be some debate about fluoride online, but almost all dentists are in complete agreement that its use in toothpaste creates one of the best tools that can be used at home to ensure dental health. Fluoride aids in re-mineralization of the teeth, protecting them from cavities and decay. It is even added to some cities water supply to help protect teeth. Because of fluorides’ beneficial impact on your dental health, the first recommendation we normally make at A Supa Smile is that you use toothpaste with fluoride in it! While some whitening toothpastes contain only baking soda, which is gently abrasive and binds to stains on the surface of your teeth, others contain harsher chemicals. If used for extended periods of time, these highly abrasive chemicals, such as hydrogen peroxide or calcium peroxide, can wear away the enamel of your teeth and result in an unpleasant yellow color and other oral conditions. Instead, for a safer and more cost-effective option, consider professional teeth whitening at A Supa Smile, either our quick and effective in-office treatment or our convenient “at-home” kits! Tartar is dangerous, and if not taken care of, it can result in loss of teeth. Tartar can lead to bone degradation when the bacteria are produced in large amount, and the body releases a certain chemical from its immune system to fight off the bacteria. The chemical that is released is a dangerous substance that affects the bone and jaw area. The best solution is controlling tartar before it gets out of control. Toothpaste containing fluoride and pyrophosphates helps in preventing the tartar from attaining a hard state. The fluoride also helps in healing and repairing the enamel that may have been damaged earlier. When your teeth are sensitive, your enamel isn’t able to protect inner layers of your teeth. Make sure to brush gently, as overly forceful brushing can cause receding gums and worn enamel. Choose a toothpaste with a desensitizing agent like potassium nitrate. Repeat use can help reduce twinges. Choose a toothpaste with the ADA seal— This should be a no-brainer! Dodge harsh abrasives—Choosing an age befitting toothpaste for your child is actually quite critical, because some toothpastes consist of harsh ingredients that may erode and wear away young tooth enamel, the protective outer coating of the teeth. Look for fluoride— Children of all ages should use toothpaste that contains fluoride, which helps protect teeth against cavities and plaque build up. Ingesting too much fluoride is not healthy, especially for young children, so the amount of fluoridated toothpaste used must be controlled. The advised amount for children under three years of age is a ‘smear,’ while a pea-sized amount is recommended for older kids. Children under two years of age generally are unable to spit out their toothpaste, so be cautious. Take flavor into consideration—Though flavor may not be considered technically relevant to dental health, choosing a toothpaste that tastes good to a child helps get him or her more excited about the routine of brushing their teeth. Make sure that toothpaste tastes good and your child will be much more likely to brush, and brush well! 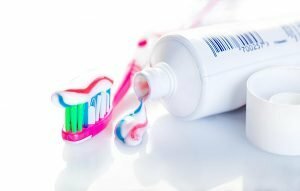 This post has discussed some of the most popular toothpastes, but there are also other specialty toothpastes for special dental conditions (e.g. natural toothpastes, toothpastes for dentures, and toothpastes for gingivitis). If you have any questions about what toothpaste is right for you, the best way to get answers is to contact us at A Supa Smile. We will be happy to sit down with you and discuss what toothpaste is best for you, as well as answering any other questions you might have about your dental care! A Supa Smile is conveniently located just off of the Maroondah Highway near Plymouth Road and Kent Ave, with public transport nearby. Contact us today on (03) 9723 0703 or book your appointment online!